Got a funny story...Eddie told me that his coworker friend was on the phone with her husband and asked him what he thinks we were having. The funny thing is - he's always been 100% wrong on all his guesses. So his guess? That we were having a boy. Well guess what? This little sweetie was very camera shy, sleepy & stubborn. She loves her feet as you can tell in the last photo. So stinkin' cute! 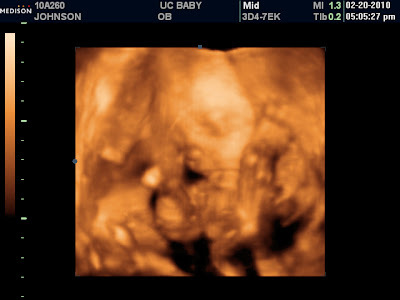 Eddie almost had a heart attack when the technician was giggling my belly to get baby to move her limbs so we could see her face. She told us we could reschedule another appointment to get better photos. We said, no thanks - we'll save it for when we meet her in person. A few so-so ones is enough. Isn't this 3D thing the best!!!! I loved mine and have so many photos. 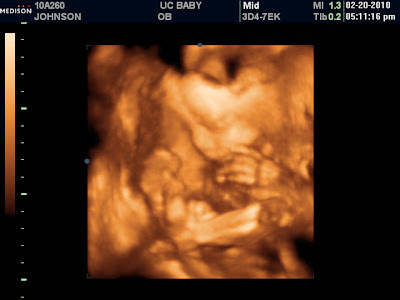 We knew we were having a boy before the 3D, but it was so fun watching. Congratulations!!!! Do you have a name picked out? Enjoy her! She is cute already. Congratulations! Little girls are amazing! Mine loved her toes while she was in my tummy too, she's just about 4 months and rediscovered them! Congratulations!!!! Now you have a boy (Mylo) AND a girl! Great news...hope you are feeling better these days. A girl! Awesome! I like Joanne's comment about you having a boy and a girl now! I'm with you.... wait and met the little person in person. I wanted to share a new baby dog tip! In the weeks before Joe was born I washed the baby clothes and let the dog smell it. Then after Joe was born I asked for a tee shirt that he wore. My husband brought it home while I was in the hospital and let the dog smell it and sleep with it in his bed. When we brought Joe home "cody" immediately checked out Joe and I never had a problem with the dog and the little boy. Cody was much like Mylo the first kid I think it helped ease the transition! Yes it is true! Over 22 guesses and the Man still holds the record for being 100% WRONG! So happy for you both. 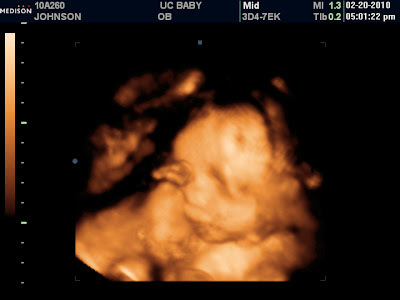 You can tell she is a cutie already, love her little nose! Sorry I am late in getting the news but congrats to you and your growing family!